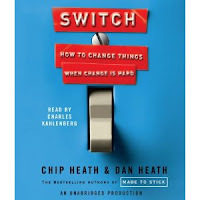 I recently listened to the audiobook version of Switch - How to Change Things When Change is Hard, by Chip & Dan Heath. I got the book largely because I enjoyed their earlier book Made To Stick. Based on their Amazon reviews, a lot of people have enjoyed these books. I liked this book. It has some refreshing views on managing change. From changing mindsets or policies in the corporate world, to changing the behavior of your spouse. I'm considering buying the book so I can easily reference and use the material. - The lowly medical interns who managed to defeat an entrenched, decades-old medical practice that was endangering patients. - The home-organizing guru who developed a simple technique for overcoming the dread of housekeeping.